Simple and filling but light. Matt’s mom makes these. Adapted from Simple Vegetarian Pleasures by Jeanne Lemlin. Serves: 4. Scrape ricotta / pureed cottage cheese into a medium bowl. Place spinach in a strainer and press out all its liquid. Set spinach aside. Heat olive oil in large skillet over medium heat. Add the onion and saute ~10 min, stirring frequently, until golden-edged and soft. OPTIONAL: Add corn at the same time as onion, and set the heat a little high so both will cook together and the corn will blacken up a bit. When onion is cooked fairly well, add cumin and cook 2 min, stirring, until toasted. Stir in spinach and cook 2 more min, tossing and stirring. Let mix cool, then stir in cottage cheese along with remaining filling ingredients (filling can be prepared and chilled 24 hours in advance). Preheat oven to 375. Butter a 9 x 13-in baking dish, or 2 smaller similar baking dishes. If tortillas seem dry, use a pastry brush to dampen edges with water. 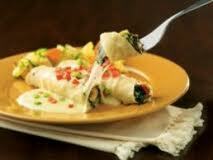 Divide spinach mix into 8 portions; place a portion along the bottom edge of each tortilla, and roll tightly. Place each enchilada on the counter as you complete it. To make the sauce, combine salsa, cream, and milk in a small, 2+ c bowl. Spoon a thin layer of sauce on the bottom of the baking dish. Carefully, to avoid spilling filling, place the enchiladas in the dish, then spoon on the remaining sauce. Sprinkle some cheese along each enchilada (may be prepared to this point up to 8 hours in advance Cover and chill if longer than 1 hour, and bring to room temp before baking). Cover with aluminum foil and bake 25 min. Remove the cover and bake 5 more minutes, until golden and bubbly. Let sit 5 min before serving.